Problems with the sending of the welcome email could be caused by no welcome email being selected for the product. If the welcome email is selected, the problem is likely related to an account creation issue, as the welcome email is sent when the module create command is completed successfully and automatically (ie. the account is created on the server). The welcome email not being sent suggests a problem with the auto-setup not occurring, so please run through the Troubleshooting Product Provisioning Problems article. The email might also fail to send due to a syntax error. Please run through the Troubleshooting Email Sending Problems article. 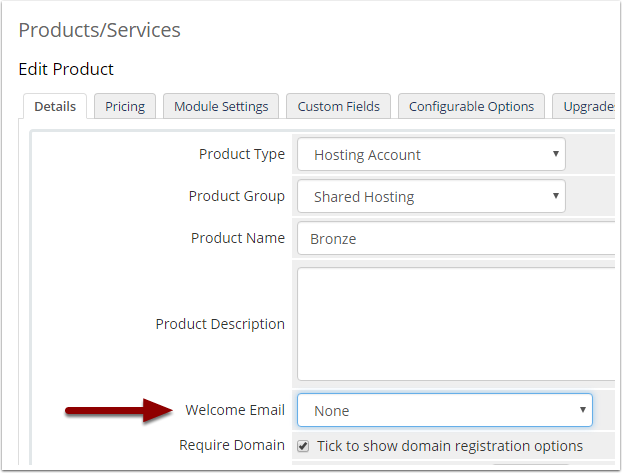 If you aren't using a module (cPanel, Plesk etc) then the welcome email can still be sent automatically by selecting the Autorelease module.